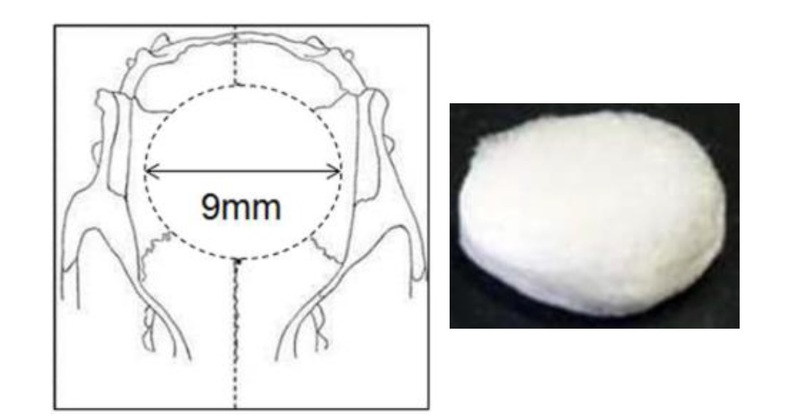 Bone defect: A 9 mm disc of rat calvaria bone was removed with a trephine bur. Two doses each (high and low) of either PODS® BMP-2 crystals, PODS® Empty crystals or standard rhBMP-2 were soaked into absorbable atelocollagen sponges (ACS) and implanted into the bone defects. The regeneration of bone was monitored with x-ray radiography in intervals for up to 15 weeks. NOTE: a single application of PODS® crystals was used. Bone volume measurement: μ-CT analysis was performed to visualize and quantify bone regeneration. The 3-D images were reconstructed to illustrate the top and coronal section views. Newly generated bone was evaluated by bone volume in bone defects assessed from the projected area of the μ-CT images. X-ray micrographs of calvarial bone defect monitored for up to 15 weeks. After implantation of treated ACS sponges, bone regeneration was followed for a period of up to 15 weeks. PODS® BMP-2 at low and high doses produced significantly more bone reformation at all time points than standard rhBMP-2, PODS® Empty or untreated bone defect. Upon resection, crystals were still present up to 10 weeks but were completely degraded at 15 weeks after implantation. No inflammatory response was observed (adapted from Matsumoto, G. et al. Sci. Rep. 2, 935; DOI:10.1038/srep00935 (2012), licensed under CC by-nc-sa 3.0). PODS® crystals can deliver growth factors localized in vivo and is therefore ideal for therapeutic use. A single application of PODS® crystals is effective in vivo and delivers therapeutic proteins for several weeks. PODS® growth factors are more efficacious at lower doses compared to standard recombinant growth factor treatments further reducing off-site side effects.